Update the look of your home decor with this transitional style ottoman Furniture piece features a built-in storage space. Use One In The Powder Room Or A Pair In Front Of A Sofa. Flutted Leg Braces Topped With A Tufted Cushion For Comfort. Strong Construction. Easy To Assemble.Size: 26In.L. x 19In.W. x 20-1/2In.H.. Cocktail Ottomans Featuring strage Bottom and Flip Flop Top of Upholstered Cushion and Serving Tray. Finished in Espresso Bycast Vinyl. 4 Tray Table: 36 x 36 x 18 In. (H). 2 Tray Ottoman: 36 x 18 x 18 In. (H). 1 Tray Stool: 21 x 19 x 18 In. (H). Accent Ottoman In A Black Leather Like Vinyl With Antiqued Brass Nail Head Trim And Tufted Finish. Size: 31 1/2In L x 19 1/2In W x 15 1/2In H. Strong Construction. Cocktail Ottoman With Storage In Tan Micro Suede Fabric And Chocolate Finish Wood. This Is Elegant And Perfect For Your Home. Strong Construction. Easy To Assemble. Size: 48 In. x 24 In. x 16 In. Leather Ottoman. Durable And Comfortable. Available In Color Black, Almond And Caramel. All Leather Rectangular Ottoman, In a Rich Chocolate Finish Accented With A Diamond Stitch Pattern And Dark Wood Base. Size: 49In L x 30In W x 17In H.
Square Ottoman Features A Dark Chocolate Top Grain Leather In a Tufted Finish And A Dark Wood Base. Size: 41In L x 41In W x 17In H. Strong Construction. Medium Brown Top Grain Leather Ottoman. Button Tufted Accents And A Contrasting dark Wood Base Add To This Stunning Piece. Size: 49In L x 23In W x 17In H. Strong Construction. Large Rectangular Ottoman On Casters And Brass Nail Head Trim, In a Leather Like Durable Vinyl. Size: 51 3/4In L x 39 3/4In W x 17 1/2In H. Strong Construction. Brown Microfiber Square Ottoman With Antiqued Brass Nailhead Trim And Tufted Finish. Size: 42In L x 42In W x 17 1/2In H. Strong Construction. Durable Leather Like Vinyl Storage Ottoman With 3 Storage Compartments, Both Sides And Center Open With Cherry Finish Wood Base. Strong Construction. 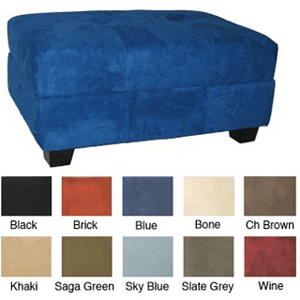 Size: 48In L x 24In W x 18 In H.
Microfiber Storage Ottoman With Tufted Seat And Cappuccino Legs. Strong Construction. Size: 54In L x 19In W x 19In H.
Black Vinyl Bench With Flip Top Seats To reveal Two Serving Trays. Size: 54In L x 19In W x 19In H. Also Available (Not Included In The Price) Black Vinyl Stool With Flip Top Seat, Size: 20In L x 20In W x 19In H.
Bycast Like Durable Vinyl in Two Colors, Black And Dark Brown. Use Them As Foot Stools Or For Seating. Size: 18In L x 18In W x 18In H.
Bycast Like Durable Vinyl in Two Colors And Microfiber In Two Colors. Can Be Used As Foot Stools Or For Seating, Flip Top Construction Reveal Storage Space Underneath Each Ottoman. Available in Brown, Dark Brown, Black And Tan. Size: 18In L x 18in W x 18In H.
More Than Just A Storage Ottoman, This Versatile Storage Cube Includes A Reversible Removable Tray Top To Reveal Storage Space Below. Ottoman Can Be used As Upholstered Foot Stool or Stool, Base Is Wrapped in Mocha Fabric And Top Cushion With An African Themed Fabric. Size: 18In Dia. x 18 1/2In H.
This Beautiful Round Storage Ottoman Can Be Used As A Occasional Table Or Ottoman, Wrapped In A Durable Leather Like Vinyl In A Rich Dark Cherry Finish With Slide Out Storage Drawers Below. Size: 40In Dia. x 20In H. Strong Construction.